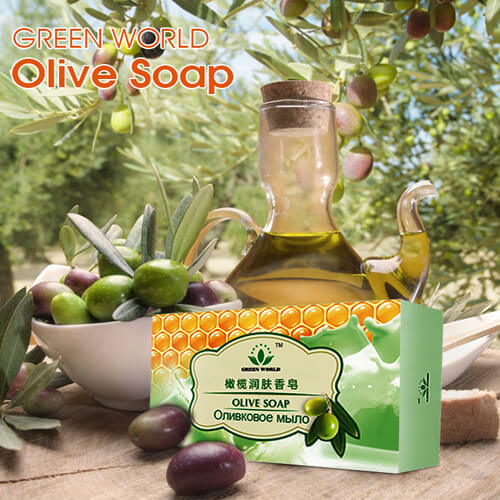 Green World Olive Soap Is Made Out Of Natural Olive Oil Essence, And Enriched With Honey, Vitamin E And Other Ingredients. It Cleanses The Skin Gently And Keeps Your Skin Tender, Smooth, Moisturized And Leaves No Greasy Feel. Olive Oil Is Rich In Squalene Of High Compatibility With Human Skin And Essential Fatty Acids. It Can Be Absorbed Rapidly By Skin And Sufficiently Keeps The Skin Elastic And Moisturized. Olive Oil Contains Rich Amount Of Antioxidants Such As Monounsaturated Fats, Vitamins, And Polyphenols. It Removes Facial Wrinkles, Slows Aging Process, Revitalizes The Skin, Prevents And Alleviates The Rhagades Of Hand And Foot. The Antioxidant Properties Of Olive Oil Can Maintain The Suppleness And Fairness Of The Skin. The Glucose, Fructose, Proteins, Amino Acids, Vitamins, And Minerals Can Act Directly Into Epidermis And Dermis To Provide Nutrients To The Cells And Promote Their Division And Growth. Vitamin E Is An Antioxidant Which Accelerates The Skin Metabolism, Improves The Blood Circulation, Promotes The Cell Division And Regeneration. It Counteracts The Free Radicals And Improves The Skin Elasticity. Olive Soap Is Mild And Free Of Preservatives. It Generates Rich Foam And Is Non-irritable To The Skin. Moisturize The Skin: The Natural Lipidure Such As Olive Oil And Honey In Olive Soap Forms A Water-lock Membrane On The Surface Of The Skin During The Short Cleansing Process Thus It Keeps The Skin Moisturized, Smooth And Supple. Moisten And Nourish The Skin: Olive Oil Gently Removes The Wasted Keratin. Honey And Vitamin E Accelerate The Cell Metabolism And Complete The Cleansing Process Enhanced By Moistening Benefits. Whiten The Skin: Antioxidants Like Vitamin E And Olive Oil Can Prevent The Production Of Melanin And Generation Of Chloasma. Olive Soap Plays Important Role In Whitening The Complex. Thoroughly Cleanse The Skin: The Olive Oil Contained In Olive Soap Produces Rich Foam, Which Rapidly Envelops Then Separates The Dirt. It Removes The Dirt Out Of The Pores The Thoroughly Cleanses The Pores, Thus Maintains The Natural Resistance Of The Skin. The Water-solubility Of Olive Oil Makes The Olive Soap Residue Rinsed Off Easily.